Dietary vitamin E supplements, often containing high doses of vitamin E, are frequently consumed by people treated with one or more prescription drugs. Interactions of vitamin E with drugs therefore need to be considered. In this chapter, we introduce the basics of nutrient-drug interactions: interactions affecting the pharmacokinetics (the metabolism of a drug) or pharmacodynamics (the effect of a drug) of drugs. We then review the evidence in the scientific literature to assess the potential of all eight vitamin E congeners to interact with drugs. In summary, there is no evidence for vitamin E-drug interactions at vitamin E intakes achievable by diet. 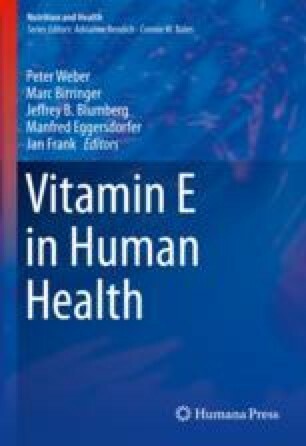 High-dose (≥300 mg/d) supplementation of vitamin E, especially of α-tocopherol, however, may lead to interactions with aspirin, warfarin, tamoxifen, and cyclosporine A. For the majority of drugs, interactions with vitamin E, even at high doses, have not been observed and are unlikely to occur.